The new exposition of mining history showcases the development of mining, from Paleolithic to modern times. The greater part of the exhibit shows mining technology and various mining techniques used throughout history. A new segment of the exposition focuses on mining machinery and equipment, with emphasis on mine engineering. 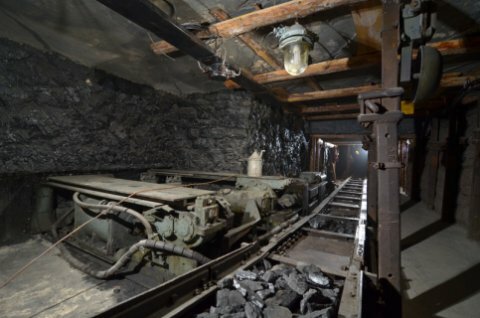 Traditionally, the most important items in the exposition are the mockups of ore- and coal-mines from the 1950s, with an area of 350 square meters (3800 square feet), which comprises a unique collection of mining gear and an authentic diorama. The mine mockup is equipped with new lighting, created by electrically powering original mine lights, carbide lamps and electric safety lamps. Visitors will descend with their own lamps, attended by a lecturing tour guide. The new outfitting will enable visitors to experience the actual conditions inside a mine. The exhibit is joined to a space called the Mountain Gaming Hall, built for interactive games and attendant programs. Visits to the ore- and coal-mines are possible only with a tour guide, after purchasing a time-specific entry pass.